The WordPress dashboard is normally the first thing you see when logging in. Upon activation, WooCommerce will add two dashboard widgets giving you an easy to access overview of your store, and a third if you have a multi-site with multiple stores. The WooCommerce Status widget gives you a quick overview of your store. It starts with the amount of sales for the current month, then will list your top selling product. Finally you have a grid of your order and stock statuses. It will alert you if you have a processing order or order on-hold. This goes the same for a product that is running low on stock or one that is completely out of stock. This widget is fairly self explanatory, showing your store’s most recent reviews. It first tries to show the reviewer’s Gravatar, if they have one, then will link to the product that was reviewed and tells you the name of the reviewer and show a short snippet of the review. Finally, there is a five-star rating shown to the right of each individual review. 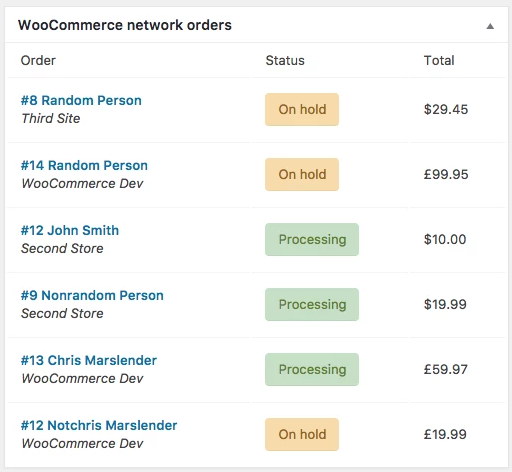 Starting with WooCommerce 3.4+ there is now a widget that appears under Dashboard that shows order information from across all sites in your networ. You can click on an order to be taken to the details of the order on that site.